by Fred Aprim, author and historian. California, USA. Bartella, or as pronounced by the locals as Baritle, is a town in the heartland of Assyria (known as Mat Aššur or Mat Ashur during Neo-Assyrian Empire). The town is situated only 12 miles (20 kilometers) east of the northern Iraq city of Nineveh (Mosul). Bartella is an ancient town, perhaps dating from the Neo-Assyrian Empire. When Nineveh, the capital of Imperial Assyria fell, Assyrians settled in neighboring small cities already existed or built new settlement around Nineveh. 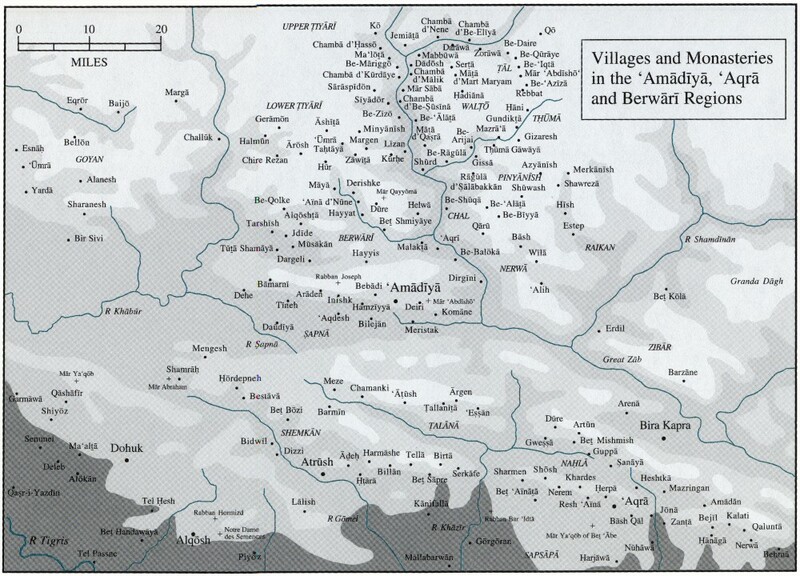 These new settlements became later the center of Assyrian Christianity in the Kingdom of Adiabene (Arbela or modern Arbil). An ancient mound (tel) in Batella, measured 42X34 meters, mentioned by archaeologist V. Plice, still waits large-scale excavation. Bartella was mentioned by Islamic geographer Yaqut (d. 1229) as a town east of Mosul and part of Nineveh and that all its inhabitants were Christians. Furthermore, it was described by Ibn Fadhil Allah al-'Amri (d. 1348) as part of the land and country of Nineveh. Bartella was reported by historians as a town between Nineveh and Arbil during the era of Alexander. Whenever digging is undertaken, gold, and silver jewelry, pottery pieces, and Assyrian coins are unearthed. A latest estimate on Bartella's population is 10,000 (8,000 in earlier sources), with the majority being Christians. One-third of the population is Catholic and the rest is Orthodox. Bartella was Christianized in the second century. With the emergence of the Christological controversies, the people and their church remained loyal to the Church of the East (Nestorian); however, it switched to the Syrian Orthodox Church (mistakenly and loosely known as Jacobite) around A.D. 610. Until the middle of the sixth century, the entire Mosul (Nineveh) plain was dominated by Christianity and under the influence of the Church of the East (mistakenly and loosely known as Nestorian), with the presence of Zoroastrian due to Sassanid rule. Towards the end of the sixth century, the "Jacobites" began to establish their presence in the region and gained control over the Monastery of Mar Mattai on Jabal (Mount) Maqloub and extended their influence to several nearby villages. By the thirteenth century, and in the vicinity of the city of Mosul, few villages such as Beth Gurbaq, Karamlesh, Beth Zabaye, and Beth Bore remained under the "Nestorian Church." However, by the fourteenth century, only Karamlesh remained Christian and the other three ceased to be Christian villages. In the plain east of Mosul, the "Jacobite Church" established themselves in the Monastery of Mar Behnam and in about twenty villages, some of which like Baghdeda (Qara Qosh), Ba'shiqa, Bahzani, and Bartella remain centers of the Orthodox Church to this very day. In the northern Mosul plain, Alqosh and its Rabban Hurmiz Monastery remained under the "Nestorian Church." However, a number of nearby villages became Jacobites as well. A group of villages along Mosul-Alqosh road remained outside the Jacobites' influence and so did several monasteries near Mosul. By the eighteenth century, Catholicism began to spread in the Mosul region and most of the Nestorian villages became under what became known as the Chaldean Catholic Church (officially established in 1830). Meanwhile, the members of Syrian Orthodox Churches that converted to Catholicism became the congregation of what became known as the Syrian Catholic Church. Bartella, meanwhile, was a village under the Church of the East (Nestorian) control. There are two stories behind the town's original conversion from the "Nestorian" to the "Jacobite" church. According to Fr. Suhail Potrus Qasha, during the era of patriarch of the Church of the East Sabr-Esho', Gabriel al-Sinjari, a Nestorian doctor who had helped Persian Queen Sherin to conceive, wanted to marry a second woman; however, the patriarch refused his request. Gabriel asked for the interference of the Sassanid king, still, the patriarch declined to entertain the king's request. Gabriel then approached the "Jacobites" and his request was granted on the condition that he converts and leaves his "Nestorian" affiliation. Gabriel was close to the Sassanid king and he succeeded to issue an order preventing the "Nestorians" from electing a new patriarch from 609 to 628 while he helped to strengthen the "Jacobite" group. The second story states that it was a powerful "Nestorian" bishop of Bartella who made the request to marry for the second time and was rejected and finally joined the "Jacobite" church to fulfill his desire, which was granted by the Jacobite's patriarch. Later, the bishop succeeded to convince the town's people to convert. Between the 7th and 12th centuries, the name Bartella is lost in the shadows of history. However, according to Fr. Potrus Qasha, in A.D. 1153, Ignatius Elia'azar (1143 – 1164), the maphiryan of Ashur made Bartella his home and see and the town became the center of Christianity in Athur (Ashur). Of course, a maphiryan is a church position that is next in importance to the patriarch. In Assyria (north of Iraq), the maphiryan was the head of church, still, he reported to the patriarch in Antioch, Syria. In 1859 (1860), the Syrian Orthodox Church under Patriarch Yacoub II abolished the position officially. However, Patriarch Yacoub III reinstated the position of maphiryan in India in 1964. When Ignatius Elia'azar made Bartella his home and see, dissatisfaction erupted among the congregation since Mar Mattai Monastery has been the traditional see of the Orthodox maphiryan. A compromise was finally reached as he returned to Mar Mattai, however, it was agreed upon that he would make it a tradition to visit Bartella and emphasize on its importance. Other maphiryans who made their see in Bartella were Dyonosius Saliba II (1222 – 1231), Gregorius Barsuma (1288 – 1308), Gregorius Mattai I (1317 – 1345), Gregorius Bar Qeenaya (d. 1361), Athinasius Abraham II (1365 – 1379), and finally Cyril Joseph III (1458 – 1470). Bartella remained Orthodox until Catholicism entered Mosul plain during the eighteenth century under the Latin and Dominican monks. These monks reached the region in 1750 and soon after, they opened a center in the city. The monks used the center to offer their humanitarian services, especially medical and educational. In 1778, as the Assyrians (also known as Chaldeans and Suryan) of Baghdeda (Qara Qosh) were leaning towards Catholicism, that attracted Toma bin Abd- Al-Masih of Bartilla from Aal Makrooh family. Soon, few of his relatives followed his suit and converted to Catholicism. In 1780, a priest, Zakariya Kindo converted and succeeded to convert additional forty families. Here, a struggle between Kindo (the Catholic) and priest Abdo Saka (the Orthodox) erupted about using the church of the village. The case was brought in front of the Pasha governor of Mosul, who gave Kindo and his group permission to pray in the church. With time, the two sides began to accept each other' denomination; they were one people after all. Today, almost one-third of the town is Catholic while the other two-thirds remain Orthodox. 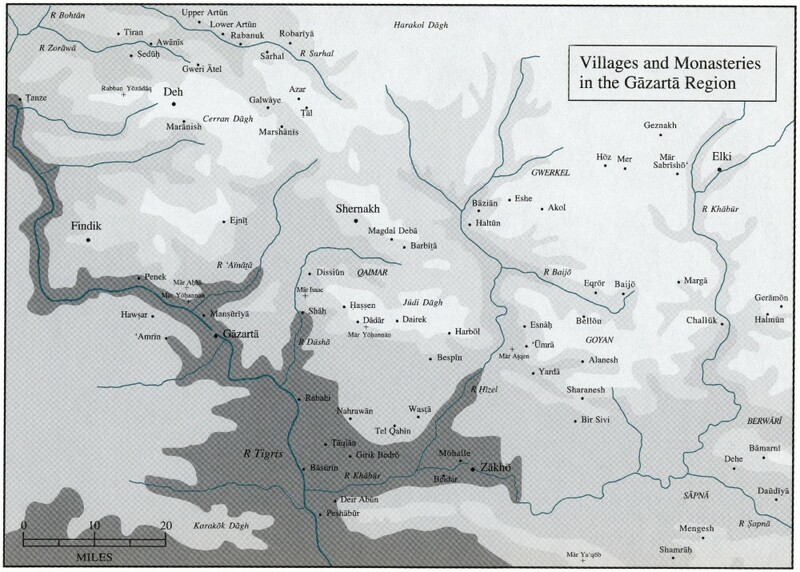 Bartella, like other Assyrian towns and villages throughout Assyria (north of Iraq), faced attacks, plunder, and massacres throughout its long history. It was destroyed at least three times by Kurds and Persians. 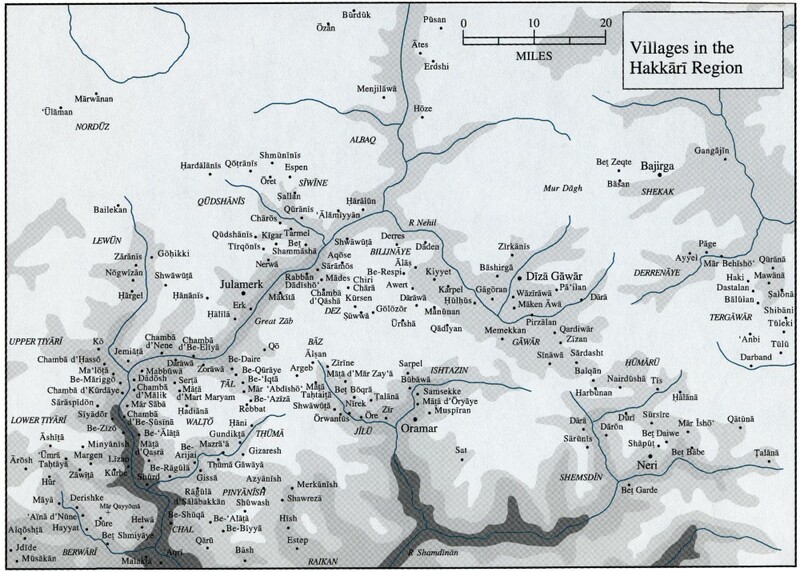 In 1171, the Kurds attacked Bartella and it was in this same year that they attacked Mar Mattai Monastery. The monks and priests of the monastery fought bravely. As the people of Nineveh heard the news, they hurried to stop the Kurds. The Kurds were beaten; however, the monks realized that the Kurds were going to attack again. Therefore, the monks agreed to sign a peace treaty with the Kurds to avoid further blood spell and paid the Kurds 30 golden Dinars. However, as soon as the Kurds received the money, they gathered a bigger army of 1,500 and attacked the monastery, caused a crack in its wall, entered and killed 15 monks, while the others escaped. In 1201, a confrontation took place between the Christians and the Moslem cleric in the town. The town's people complained to the mayor, who punished the Moslem cleric by beating. The cleric went to Mosul and on the following Friday, he gathered a large crowd in the main big mosque and agitated them. The crowd soon marched toward Bartella to destroy it. However, when they reached the town, its gates were closed and could not enter. They returned angry and on their way, they passed by the church of the Tikritis (MarZena Church). They broke the doors, entered and plundered and spoiled everything they found inside and took all valuables in the church. Today, MarZena Church, situated in the al-Najjareen area near Bab al-Jisir al-Qadeem (the old bridge gate), has been converted to the al-Khallal mosque. In 1261 and 1369 (1373), Kurds attacked Mar Mattai Monastery and every time they killed more monks and plundered the monastery. The effect of these attacks reached Bartella as well. In 1738, the Persian king sent his army under Nargis Khan to Assyria where he destroyed many villages in the Nineveh plain. In 1743, Persian Nadir Shah destroyed additional villages after besieging and entering Kirkuk and Arbil. He attacked Bartella, killed many men and took many young men, girls and women away. In 1756, 1757, and 1758 a great famine swept Bartella and many traveled to Kirkuk and other Persian towns to purchase new grain, where they faced plunder and robbing at the hands of Kurds. In 1789, Bartella was plundered again by Jolu Beg bin Bdagh, the Emir of Shikhan, during his war with the Arab Emir Mohammad bin Hasan al-Taa'i. Mar Aho Dama Church. The church was built in the memory of bishop Aho Dama who was beheaded in 575 by the Sassanid king Khusrau. The church is mentioned in the records of the Church of the East. In 1153, Maphiryan Ignatius La'azar built a great temple. In 1933, a piece of stone was found within its remains with Syriac inscriptions stating that a certain deacon, Michael, had passed away in February 1386. Mart Shmoni Church. The church is old for sure. It was perhaps built after the destruction of Mar Aho Dama Church. It was renovated in 1807. Then brought down completely and rebuilt in 1869. The construction included the transfer of a piece that dates back to 1343 from the Assyrian village of Ba-skhraya. The old Mar Giwargis Church. This church is abandoned today. It is believed that the church was active in 1701. The new Mar Giwargis Church. The church ground breaking was in 1934 and was completely built and dedicated in 1939. The Church of the Virgin. The church of the Virgin Mary was completed in 1890. However, manuscripts mention the presence of the church of the Virgin Mary from the fifteenth century. Al-Sayida Church. The complete demolition of Al-Sayida Church came in 1934 as its bricks were used to build the new Mar Giwargis Church. It is worth mentioning that there is one mosque in the town for the small Arab Moslem population. Mar Giwargis Monastery. Was present and vibrant in 1701. The Monastery of the Forty Martyrs. The history of this monastery dates back to 1269. A part of the monastery is demolished; however, the congregation continues to visit it. Mar Youhanna Monastery. Its remains are found on the side of the main road north of Bartella. The monastery is ancient and it is hard to pin point the date of its construction. The Assyrians (also known as Chaldeans and Suryan) of Bartella have begun an impressive project to build a huge cultural and religious center in town. With the removal of the Ba'ath regime and the gradual disappearance of traces of Arabization, this cultural center would help the locals to learn more about their history, as proud new generations will guide the town to a better future. The monastery is situated on a small hill near Bartella. It took its name after Mar Daniel the Hermit, who accompanied Mar Mattai (St. Matthew) the Hermit after leaving Amid (Diyar Bakir) heading to the land of Nineveh in 363. The monastery became popular with its other name, i.e. the Monastery of the beetles, as large numbers of small beetles had made it a habit to be found inside the monastery during the monastery's festival that falls on October 20 and goes on for three days. The beetles strangely disappear after the festival. Forty minutes walk from this monastery there is another monastery with the same name (called the lower monastery) that was used as the home of the monks. The monastery is mentioned by Arab historians like al-Khalidi, al-Shabishti, and Yaqut. It was mentioned by Mar Gregorius Yohanna (Bar 'Abraya) in his work during the events of 1261. On page 517 Bar 'Abraya (Ibn al-'Abri) writes that in those days, the Christians of the village Baskhraya and others from Nineveh came to the Monastery of the beetles. However, when they left and crossed the Zab River to head for Arbil, they were met by Emir Qotlu Beg, who thought that they were the enemy and killed them all, men and women. Some four miles (7 kilometers) northeast of Bartella is the village of Baskhraya. It entered history around the early parts of the twelfth century by al-'Abri. During the Kurds' attack on Mar Mattai Monastery in 1171, the Christians of Baskhraya defended the monastery gallantly. In the Mar Mattai Depository, there is a manuscript of the New Testament in Syriac and Arabic dates back to 1177, the golden era of this town. It was written by a certain Marbihna bar Yousif Markeez bar Toma from Baskhraya. In early thirteenth century, the situations began to deteriorate due to the struggle between the Mosul Governor, Badr al-Din Lu'lu', and Governor of Arbil Mudhaffar al-Din. The soldiers from Arbil kidnapped a girl from Baskhraya. The people of Baskhraya fought and struggled until they succeeded to get the girl back. The soldiers complained to their governor who punished the Christians of Baskhraya and forced them to evacuate the town. The village people did not give in; however, the death of Badr al-Din Lu'lu' ended their hopes. The last known manuscript about Baskhraya is dated 1394. Patriarch Mar Ignatius Yacoub III states that the village people left Baskhraya to Bartella finally only in the eighteenth century and that their descendents remember their origin from Baskhraya. Today, Baskhraya is neglected and abandoned by the Christians with the exception of the 1000 Shabaks (Turko-Persian people) that are living in the village. Half an hour walking distance from Bartella towards Baghdeda, is the Assyrian village of Bashbeta. It uses to be a Christian village; however, today some 700 Shabaks occupy it. The Christian background of the village is in a manuscript dating back to A.D. 1220. However, there is another Syriac manuscript, which describes the extermination of the Christians of the village of Bajbare, perhaps Beth Jabbare (Home of the Giants). Certain customs in Bartella are interesting to address. During the period between the engagement and wedding, the grooms' mother invites women and girls to her home every Sunday, or any other day that coincides with a festival, during this period. She makes special plates that are filled with different types of seeds, sweets, and dried fruits. Then the plates are covered with colorful handkerchiefs as the whole group proceeds to the bride's home and present the bride with such gifts. Three or four days before wedding day, the wall that sits above the front door is painted with beautiful colors and decorated with flowers and roses in an arch shape. Inside the house, the walls of the new quarters in which the newly weds are going to use are painted afresh as they could have been darkened from the smoke that is generated during the winter season when families use wood for heating. Symbols of the cross and angels would also be drawn on the walls to chase away evil and bad spirits. Some of the best goldsmiths are found in Bartella. The business is very active in town and specially the molding and fashioning of gold and silver. Most of the work is for local consumption, with orders being especially high during the wedding season and festivals. Tahiniya (a sweet made of sesame seed meal and sugar), is considered one of the main food products for the town's people. The business is healthy due to the good quality that the manufacturers in Bartella produce for the local use or export. The Tahiniya is sold in many of the neighboring villages and nearby cities. Assyrians (also known as Chaldeans and Suryan) have been facing Arabization and Kurdification processes in north of Iraq. With the liberation of Iraq and the rise of Islamists and Kurdish power, it is vital that assistance is made available and help to protect our villages in the Nineveh plain. We must begin to help our people from Basra, Ramadi, and other cities in Iraq to retreat to Nineveh plain where the last Assyrian stand remains. We must help our villages in the Nineveh plain to prosper. The Diaspora Assyrians (including Chaldeans and Suryan) could establish joint ventures with the people of Bartella for example to import jewelry pieces or other crafts like the Tahiniya that are made in Bartella. For this last Assyrian stand in the Nineveh plain to survive, we must revive the economy of these last Assyrian villages. Fr. Suhail Potrus Qasha. Bartleh in History. Beirut, Lebanon: Toma Printing, 2003. Habib Hannona. The Church of the East in the Nineveh Plain. Amman, Jordan:1991. Mar George Saliba. Ma'idat Antakiya (The Dining-Table of Antioch). Beirut, Lebanon: Sharikat al-Tabi' wa al-Nashir al-Libnaniya, 1992. Wilmshurst, David. The Ecclesiastical Organisation of the Church of the East, 1318 – 1913. In Corpus Scriptorum Christianorum Orientalium. Vol. 582. Tomus 104. Lovanii: Peeters, 2000. Assyrian Christians, What Will Their Fate Be?